I worry that Alla Leather Art has tried too hard to please contemporary fashion fans this time around. Perforated leather is right on trend. 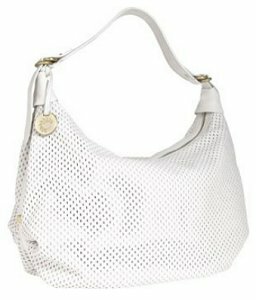 In white leather it looks fresh and sporty. But all those holes make it difficult to appreciate the quality of the leather, which has always been one of Alla Leather Art's strengths. It might be fashionable now, but once our taste for perforated leather fades I wonder whether the Rondo will get as much of a workout. For now though we'll enjoy all the interior space provided, and the convenient array of inner pockets. These are trimmed in more of that white leather to help them last, although I wonder whether the shiny lining will be as durable. At $279 this is another relatively affordable bag from Alla Leather Art, but I don't think it's one of the label's best. If you want to indulge in the current trends though you could certainly do worse. The small Alla Leather Art Rondo hobo bag, a great alternative to this large bag.